AVOID the 900 Blk of E. Holt /Reservoir for the next several hours due to a traffic incident. We are closing down the 900 Blk. of E. Holt between Reservoir and East End to due to a Hit and Run Traffic Collsion. An unknown vehicle struck a male adult pedestrian and fled the scene. The pedestrian has been transported to a local hospital in critical condition. 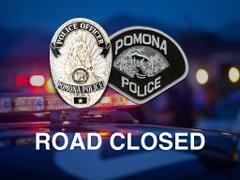 We anticipate a 2-3 hour closure while the investigation is being completed. We are asking for any potential witnesses to contact the Pomona Police Department at (909) 622-1241.